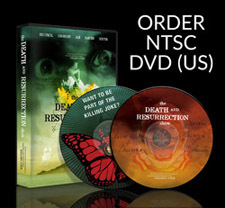 WE'RE REBUILDING THE WEBSITE, BUT YOU CAN STILL ORDER DVDs AND BLU-RAYS! "THE DEATH AND RESURRECTION SHOW"
The Death and Resurrection Show is a feature length music documentary charting the turbulent, dramatic and often unbelievable journey of the British post-punk industrial legends Killing Joke. The film brings together three decades of archive footage with two decades of never before seen new documentary footage and unprecedented access to the members of Killing Joke, their management, music producers, industry figures and associates. The film explores the progression of the band and their music; the in-fights, splits, reformations, legal tussles and side projects into classical and trance music, but it also delves deep into the other side of Killing Joke and it's core members. Brought together by a ritual ceremony performed in London, the 30 year experience that followed saw them constantly experimenting with the ritualistic, esoteric and mystic elements in their lives and their music. Numerology shaped albums, experiments in sound waves and psychological manipulation refined live performances whilst ancient texts and prophecies drove them to the world's mystical sites. From rituals at Iona and Glastonbury to recording sessions in the Egyptian Pyramids, living feral at the Nazca Lines, disappearing to Iceland for the apocalypse and discovering a mysterious island at the end of the world. Killing Joke have innovated, amazed, shocked and repulsed throughout their careers, creating an influence that has stretched throughout the industry from Dave Grohl to Nigel Kennedy, Jimmy Page, Hinewehi Mohi and the Prague Synphony Orchestra. Famously described as "the sound of the earth vomiting" there isn't another band, or music documentary, in the world like this one. Created by lifelong Gatherer and filmmaker Shaun Pettigrew with underground British indie Coffee Films and Killing Joke frontman Jaz Coleman. 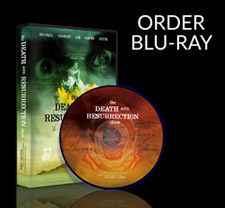 Featuring interviews with members of the band past and present, Jimmy Page, Dave Grohl, Peter Hook, Chris Kimsey, Dave Bianchi, Matt Luxon, ET, Tony Assassin and Alex Patterson; The Death and Resurrection Show is available now on DVD and Blu-Ray.